SANTOSH BAKAYA: Poetry for me is the outpouring of my innermost feelings, my anger, angst, anguish, my small joys, my big disappointments. Poetry is therapeutic, cathartic and rejuvenating for me. It is that itching in the fingertips, which can stop only when the fingers jab away at the keyboard, in a spontaneous outpouring. It is that restlessness in the heart which follows the witnessing of a poignant scene. The rustling of the leaves, the feisty balloons cruising merrily in the sky, the moon peeping through a thick canopy of clouds, the happy chortle of a child, a mother’s relief when her lullaby has put her child to sleep,a spunky child chasing a runaway kite can send me into a poetic tizzy. Poetry is something which elevates me, and infuses new life in me when I am feeling down in the dumps. SANTOSH BAKAYA: Everything evolves, so does poetry. Poets have started experimenting with newer forms. Poetry in the contemporary world has undergone many changes. Blank verse has become the norm, and rhymed poetry is often frowned upon. But, for me, the inherent rhythm and lyricism in poetry continues to be important, no matter what others believe. SANTOSH BAKAYA: Well, whenever I write a poem, it is my heart that propels me onwards; it is as if I am pouring out my heart on paper. There is no creative process as such, I just put my fingers on the keyboard and the thoughts flow – just like that! I merely have a vague idea what I want to write about, and the words suddenly appear, and I love making them do my bidding. But sometimes, the words are like audacious rabbits, skittering out of reach, so getting hold of them becomes quite a difficult task. Often, a particular scene goes straight to my heart, and I whip out my notebook, which I always keep handy, and immediately jot down my thoughts. The following poem was written while I was in the car, caught in a traffic jam. Surviving on the leftovers hurled from the five-star hotels. where they lay, cheek by jowl. next to a beggar with an empty begging bowl. under the cover of night; a benediction. Learning to cope with life; an infliction! one emaciated arm thrown over his brother. The invisibles slept; condemned and forsaken. Unseeing eyes chasing dreams, unborn. SANTOSH BAKAYA: Many are the times I have poured the contents of my roseate dreams into my poetry, and often nightmares have plagued me, which have also found their way into my poems. Sometimes, I have had a nightmare, where I have found myself being stalked by death and on getting up, I have put it on paper. SANTOSH BAKAYA: Well, I have always been inspired by nature. I love going for morning walks, and the beautiful scenes that I witness during this time, when even the sun is feeling too lazy to yank away the cover of night, the early morning chirping of birds, the frolicsome pups, all provide me food for thought. But, I am also plagued by the al- pervasive injustice and unfairness, poverty and, child abuse and blatant discrimination, and this has also found expression in my poems. SANTOSH BAKAYA: My first verse in the sixth standard was inspired by just the thought of being able to write a poem – so the first poem that I wrote was about a haunted fort. But, later on as a mature adult, my verses were inspired by nature, especially the River Lidder in my homeland, Kashmir. The emotions of loss, longing and reclamation were uppermost in my verses. SANTOSH BAKAYA: I never aspired to become a poet, but when I was in the sixth standard, I was overawed by a newcomer to the class, who used to say that she was a poet , I too tried my hand at poetry , but , I knew , I was a total disaster ! But, at that stage, I started writing limericks, which became quite a hit with my school friends. After school, I wrote only in sporadic outbursts. 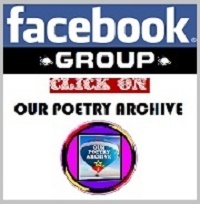 Later, with the coming of Facebook, I started writing poems on Facebook, which were appreciated and this enthused me into writing more and more. In the year 2014, I received the first Reuel International Award for excellence in writing and literature for my hundred page poem, Oh Hark! Instituted by the internationally acclaimed academician- poet- critic – Pushcart nominee, Dr Ampat Koshy [The Significant league], and I started being acknowledged as a poet. 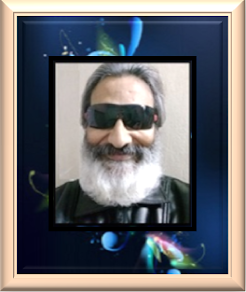 In the year, 2015, my poetic biography of Mahatma Gandhi, Ballad of Bapu [Vitasta Publishers, Delhi] was published, and the international acclaim that it received was indeed very encouraging. Now, there was no looking back. 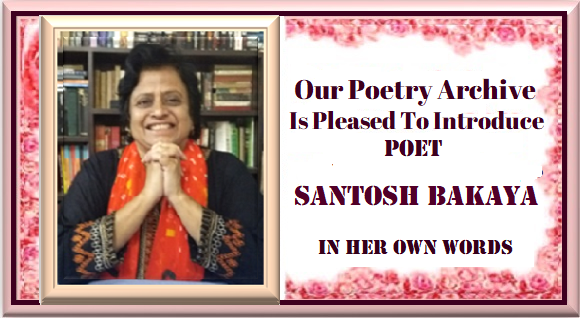 SANTOSH BAKAYA: The first person that I read my poem to, is my husband, who, has also been a student of literature, and is steeped in romantic sensibilities, or to my daughter, if she is around. A post- graduate in English Literature, she has a very keen literary sense, and has a very good grasp of post- modernism. So between the two of them, I find my balance. “Get over your hangover of romanticism, the times they are a changin’”, she quips. “Never lose that romantic flavour. Write what you feel most comfortable in.” That is my husband’s perennial refrain. So, I continue to stick to my romanticism, unfazed by the demands of the changing times, and am content to be a square peg in the post- modern world. SANTOSH BAKAYA:As I mentioned earlier , In 2015 , my poetic biography of Mahatma Gandhi , Ballad of Bapu was published[ Vitasta, Delhi ] and I also have I have two collections of poetry, Where are the lilacs? [2016, Authors press, Delhi] and Under the Apple Boughs [2017, Authors press, Delhi]; the first is a collection of 101 poems on peace, and the other is an anthology with four sections 1Memory Shards 2 Crippled rhyme 3 Nature sings a symphony 4 OAfrica [a result of my five day trip to Accra, Ghana in May 2016 as a delegate of Pentasi B World Friendship Poetry] When these books came into my hands, I was initially very apprehensive, afraid of any typing errors or printer’s Devil that might have inadvertently crept it, so it was with a heavily palpitating heart, a dry tongue and quivering hands that I flipped over the pages.WhenI realised, that the books had been beautifully produced, I was as happy as a child, and kept the books on my table for many a day, every now and then, flipping over the pages and reading a poem or two. SANTOSH BAKAYA: There is no dearth of poets who inspire me and every poet has a distinct voice and a particular way of prodding me on. I have always been a romantic at heart, and sometimes my friends ask me to rise above my romantic leanings. But, my poems tend to inadvertently get influenced by the Romantics. Besides Shelly,Keats, Coleridge and Wordsworth, I have always loved Edward Lear, Edgar Allen Poe, T. S Eliot, William Blake and Robert Browning. SANTOSH BAKAYA: My poems, mostly simple, can sometimes be multi- layered and nuanced, but the underlying meaning is not difficult to decipher. I am often accused of using too much intertextuality. Yes, it invariably creeps into my writings, but otherwise the poems are quite transparent. SANTOSH BAKAYA: Most of my poems are nostalgic – and I write a lot about my childhood, my parents, and my old home. I also write a lot about nature. A poetry book, soon to hit the market is a collection of my humorous poems, There goes the dinner gong. Yes, the recurring themes are of nature and nostalgia. “Let there be no more blood – drenched sunsets, no more discordant melodies, no more dirges. Let us make things happen. Maya Angelou’s words resound with a robust hope, that we are the miracles who can make things happen, only when we come to it: “When we come to it we must confess that we are the possible we are the miraculous, the true wonder of this world/That is when and only when we come to it.” So, let us come to it, through concerted action, relentless campaigns and unremitting crusades setting this ugly world right. SANTOSH BAKAYA: No, I don’t write only about myself, but I am also concerned about the various issues facing the world. The rampant intolerance, bigotry, unfairness,racism, hatred and rancour. I firmly believe in Martin Luther King Jr’s dictum,‘an injustice anywhere is a threat to justice everywhere,’ so any injustice in any part of the world has found expression in my poetry. In the following poem, ‘A chunk’, I write about the evil of female infanticide. Scary silhouettes sneer, as she wipes a tear. Hallucinations take human form, scuttling near. from the charred embers of her mind. Slowly, silently. On cat’s feet. her tiny silhouette appears before her. A mute sigh an unasked question, ‘why’? Sounds ricocheted against the walls of her brain. She clamped shut her ears, as the chorus peaked. Up went the cry, down the scalpel. The timorous sky shuddered as another one was murdered. Another on her slender neck, unformed too. The woman reads those lips. “Why?” The tiny lips ask. The trees outside don’t sway; they appear rooted in a breezeless stupor. but the tiny thing evanesces, dissolving into nothingness. but the searing anguish remained. It crackled at the ends of her hair. A scraping sensation near her heart. still throbbed, robbing her of sleep. A phantom pain in her womb and lingering echoes. SANTOSH BAKAYA: Every person has a different way of looking at things, hence every person is unique. We just cannot imagine Wordsworth writing Prufrock, or Eliot writing, The Solitary Reaper. Every poet speaks in a voice, unique to himself or herself. Some poets specialise in dealing unflinchingly and relentlessly with particular issues, looking at them through a personal lens. Some poems reflect the personal faith of the poet and for some, confessional poetry is their forte. Some poets are known for their use of bold imagery, unexpected line breaks, some love talking of displacement in a progressively globalisedworld. I don’t know whether what I write really qualifies aspoetry, because I unabashedly pour my heart out about things I feel strongly about, and this unfettered pouring out of emotions, might appear naïve to many. SANTOSH BAKAYA: What is real and what unreal, differs from person to person. Some poets allow the essence of their very being to be revealed in their poems, some seeking closure, pour out their bottled up feelings in a cascading poetic eloquence, some can be very verbose and expansive, and some resort to minimalism. What is real for one, can appear unreal to many. To me, real poetry is when I have poured my heart out , manging to say what I wanted to say leaving me with a happy afterglow , and a sense of fulfilment . SANTOSH BAKAYA: For me, imagery is very important in poetry, in fact, I cannot imagine poetry without imagery. I strongly feel that the usage of words in a poetry should be such that it evokes a mental picture in the readers’ minds, making all the senses of the readers to come to the fore. They should be able to ‘see’ things through the vivid mental pictures that the poet draws. SANTOSH BAKAYA:In India, poets feel comfortable with all types of poetry, lately, ghazals and rhyming couplets have become quitepopular. Haiku isalso very popular in India, and poets have started experimenting with newer forms of poetry. Sonnets and odes are still very popular in India, but ballads and narrative poetry seems to have taken a back seat. SANTOSH BAKAYA: I feel that a good poem should come directly from the heart, ofcouse, for me imagery is very important. No matter what some poets feel, for me grammatically incorrect and syntactically challenged poems can never qualify as good poems. SANTOSH BAKAYA: There is no dearth of poets in the present literary scene. To name a few would imply being unfair to those inadvertently left out. Suffice it to say, that all poets have a distinct voice and they have manged to carve a snug niche for themselves. 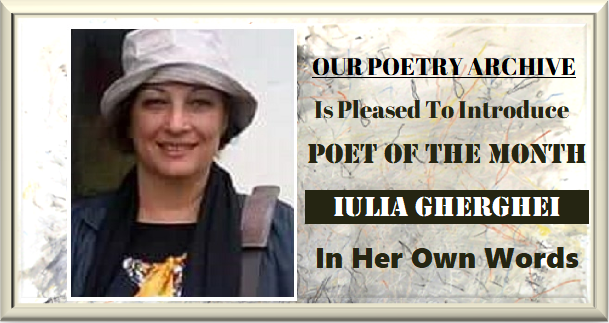 Today’s world has been torn asunder by war , intolerance , bigotry and hatred , so we find poets expressing their anguish about war , and emphasising the importance of peace , nonviolence , love and tolerance .Homelessness and the refugee crisis also figures a lot in the poetry of the present poets . Gender violence \ child abuse are very sensitive issues and lately, many anthologies have been published touching this theme. SANTOSH BAKAYA:: My poems are steeped in nature imagery , because I just love nature . Let me reiterate that my heart yearns for peace, and my eyes are always on the lookout for that tiny dove, suddenly chancing upon a twig with a few green leaves,enough to send it into a paroxysm of a trilling ecstasy. My ears are perennially attuned to the ripple and roar of River Lidder of my homeland Kashmir, hoping to read in its undulations, a message of peace and the thrush pouring her melody on the gore drenched ground is a recurring image in my poems. SANTOSH BAKAYA Most of my poems are about my childhood, and hence they make me feel nostalgic. Some deal with the myriad issues plaguing the world, which make me introspect, others are about nature, which are very uplifting and edifying, and leave me with a happy after glow. SANTOSH BAKAYA::In my poetry , it is mostly I who speak , sometimes I speak to myself , indulging in self- introspection , sometimes I speak to others , and sometimes I speak in the voice of others . Sometimes, I speak through an aborted female foetus , at other times , I get under the skin of a rag picker, and question the world about its injustice , sometimes , I am a refugee child , missing his dog, as he trudges along on strange terrain , clutching on to his parent’s hand , wanting to know what will happen to his pup that he left behind . SANTOSH BAKAYA: I mostly want to convey the message of peace, love and universal harmony. Firmly believing in Gandhi’s dictum that an ‘eye for an eye and a tooth for a tooth, will make the whole world blind,’ and Martin Luther King’s prophetic words, ‘over the bleached bones and jumbled remains of civilisations are written the pathetic words, ‘too late’’, I am a staunch believer in the redemptive power of love, and am convinced that it is futile to waste our time in hatred and animosity, when it is easier and simpler to love.Why cry over spilt milk when everything is lost and gone down the drain? That is the message that I want to convey through my poetry. It is indeed pathetic that we are diving headlong into rat races of all sorts –races of ego clashes, of weapons, of mutual destruction, and warmongering. If this continues, we will soon find ourselves racing brakeless, towards total annihilation. In this present topsy- turvy world, it is normal to bludgeon a person who does not toe our line, it is normal to clobber dissent into silence, and it is also painfully normal to shrug off the brutal killing of children . Why should we allow brute strength to hold sway?Why should we be forever seeing blood on the streets, and hear the sound of war drums endlessly? Though my poems, I try to drive home the point that here are peace notes scattered all around us and we should prick our ears to the sparrow’s peace song, to the dove’s peace dream and to the child’s guileless chortle. Why not listen to the petite flautist who sings songs of peace in dark alleys, or the white cheeked-bulbul who belts out song after song, strewn with notes of peace?Let us not hear the discordant sound of war drums, or a litany of woes, but listen to the angel of peace swinging from boughs, chirping from trees, and humming the melody of love. It is high time that we strung those peace notes into a love song drowning all strident notes of ear- callousing cacophony. SANTOSH BAKAYA:Of course, in this age of internet and social media, whatever you write, can be read by many. 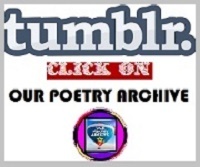 With one click, one’s writings are accessible to the world. Instant gratification and validation is of course encouraging, but that is not the reason I write. I had this itch to write even during the time, when there was no internet, but then, my writings would be read either by my parents or siblings, or sometimes by my friends and teachers. But with the coming of internet, they have a larger readership, and that of course makes one happy. The reason I write is that I just love to write. I would have written even if there had been no internet, because writing for me, has proved to be therapeutic and cathartic, I have always found it uplifting. I want to write about everything – about the way the cat stretches itself languorously, about the susurration of grasshoppers’ wings, playful babblers perched atop a twig, the music of a mother’ lullabies , the ceaseless industry of ants , the falling of autumn leaves , snow fall in my homeland, Kashmir, about the glint in the intrepid rag picker’s eyes, clear eyed compassion, the fragile tenacity of an emaciated beggar boy ,about the puckish smile on an elfin face , about life’s whimsicalities . I worship the incredible hues of nature’s palette unremittingly. I write about the gypsy woman, the vagrant cloud, the mountain peaks and I try to resurrect the hues of my beleaguered homeland. When the world creates a bloodcurdling cacophony of vacuous rhetoric, when it spews hate and venom, I quickly escape into my safe haven of poetry, where I can make the words dance to my own tune, and create a utopia, where the euphony of peace and love reigns,endlessly. SANTOSH BAKAYA OPA is indeed a very inspiring web journal. 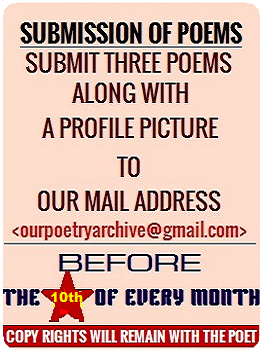 I have been regularly submitting my poems to the journal, where I have come across some wonderful poets. May the journal go from strength to strength.